An Apple patent published Tuesday details work on a magnetic connector interface akin to the recently introduced Smart Connector, but instead of being limited to one accessory, the proposed design can stack plugs to mate with and support multiple peripherals. As awarded by the U.S. Patent and Trademark Office, Apple's U.S. Patent No. 9,300,083 for a "Stackable magnetically-retained connector interface" outlines a method by which two or more plugs feeding peripheral devices can be stacked vertically, one atop the other, on a single surface-mounted connector. The document lays out two potential embodiments, one featuring two contacts and another with three contacts. Both embodiments include a magnetic retention mechanism that aligns, mates and secures accessories or accessory cables without the usual spring-loaded clips, prongs or other form of physical attachment. For reference, Smart Connector, available on 9.7- and 12.9-inch iPad Pro models, uses a three-pin configuration for power, ground and data. 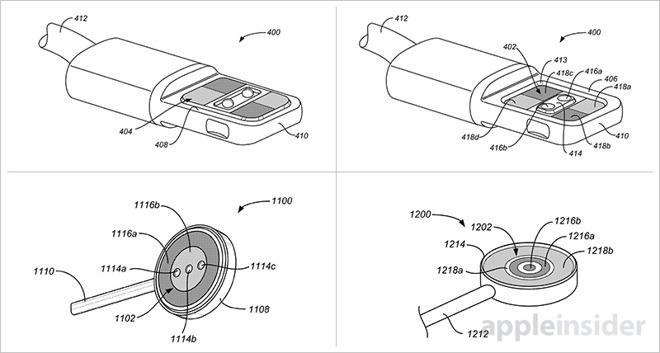 Apple proposes a variety of format options for the connector body, including designs built in to Lightning connectors. One version looks like an Apple Watch Magnetic Charging Cable, but with a set of three Smart Connector contacts instead of the usual inductive charger hardware. Another features bare contacts laid out in concentric rings, a common design seen in Apple patents covering wireless charging technology. Stackable plugs sport contacts on both sides, though single-ended variants are possible. When the magnetic connector mates with a host device, either directly or through the stack, the attached peripheral sends a signal informing onboard detection circuitry that a positive connection was made. Said signal also provides information regarding the plug's orientation, a critical piece of information for correct power and data routing. The control process is managed by routing circuitry on the host device and, for power, one or more microcontrollers. As an example, a successfully connected pair of earphones would mate with a host device, signal successful plug mating and request power and audio data. Similarly, an AC/DC adapter would signal availability of extra power for charging the host device and its connected accessories. Apple says any number of peripherals can benefit from its stackable architecture, including battery packs, keyboards, external storage units and more. Working off a single port, the method is much more compact than the usual array of USB, Thunderbolt and headphone jack ports seen on modern computers. In addition, the general lack of moving parts, save for spring-loaded pogo contacts, makes for a robust interface nearly immune to daily wear and tear. 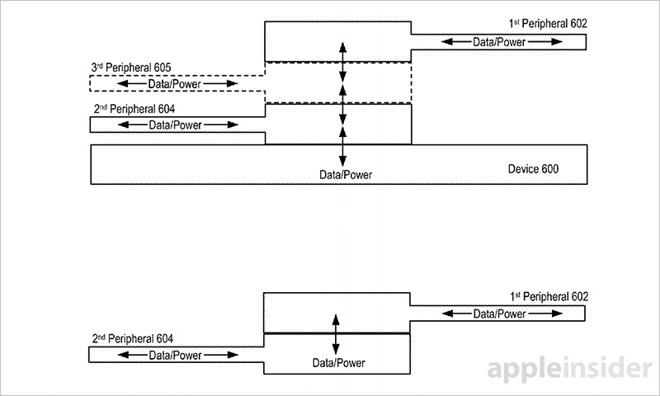 Along with a host iOS device, Apple suggests connector stacking might be useful in a docking station, providing hands-free viewing or data offloading technology for a variety of devices. A dock might also include conversion circuitry and support for common connector formats, allowing it to serve as a universal adapter. It is not known if the current Smart Connector iteration has the bandwidth to support a stackable connector architecture. However, if and when the patented technology becomes available it would address a major concern for consumers looking for thin-and-light laptop replacements, namely iPad's limited expansion options. 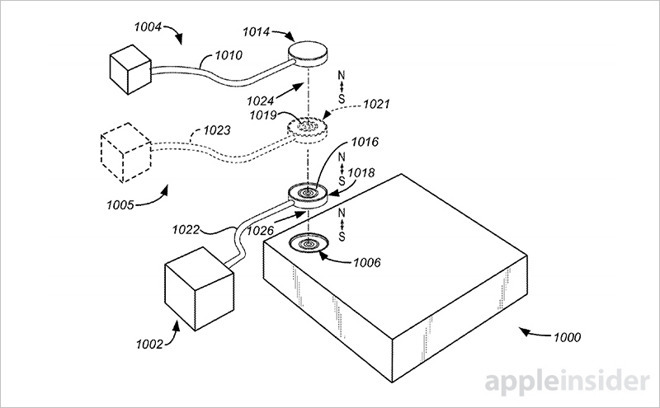 Apple's stackable magnetic connector patent was first filed for in September 2014 and credits Nathan P. Bosscher, Eric S. Jol, Albert J. Golko, Jeffrey J. Terlizzi and Jahan C. Minoo as its inventors.